In this game, the performer will have to set a price per roll and set up 6 prizes. The game cannot be started without all 6 options (dice faces) and a price being set. the price input field has a limitation of 3 digits. the prize input fields have a limitation of 25 characters. Once the game is started, all viewers on the room will have the Play Roll the Dice button in the action bar under the player, and will receive a chat notification that the game is active and the possible prizes. 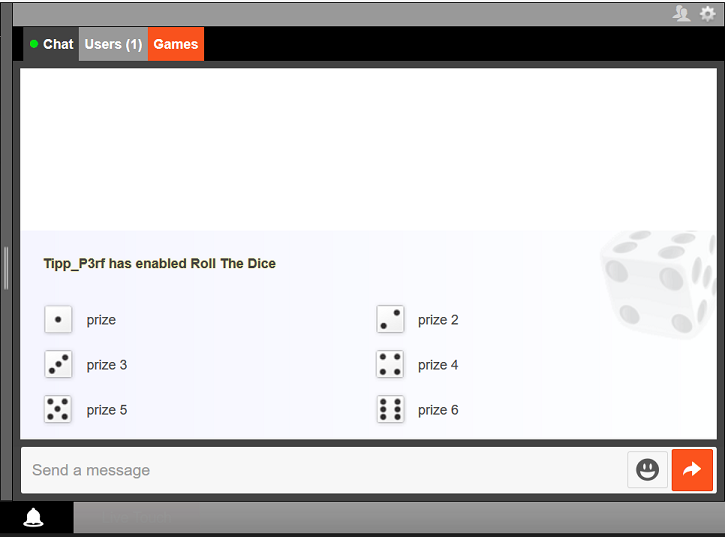 Once clicked the Play Roll the Dice button a game window will be opened over the chat. Here the viewer can see the price per roll, the prizes that they can win and a Roll The Dice button, which will randomly choose a prize once it is clicked. 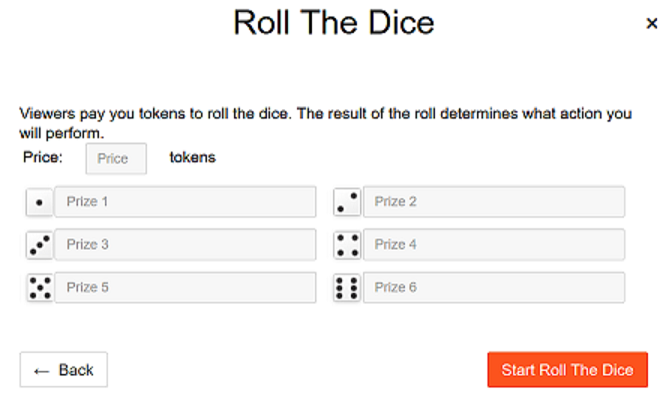 After a roll the game will be paused for 1 minute, to allow time for the performer to give the reward that was won. If they don’t need that much time, performers can reset the timer. In this game, the performer can set up to 12 prizes with the cost they choose. An option to be added to the game must have a prize and a cost. 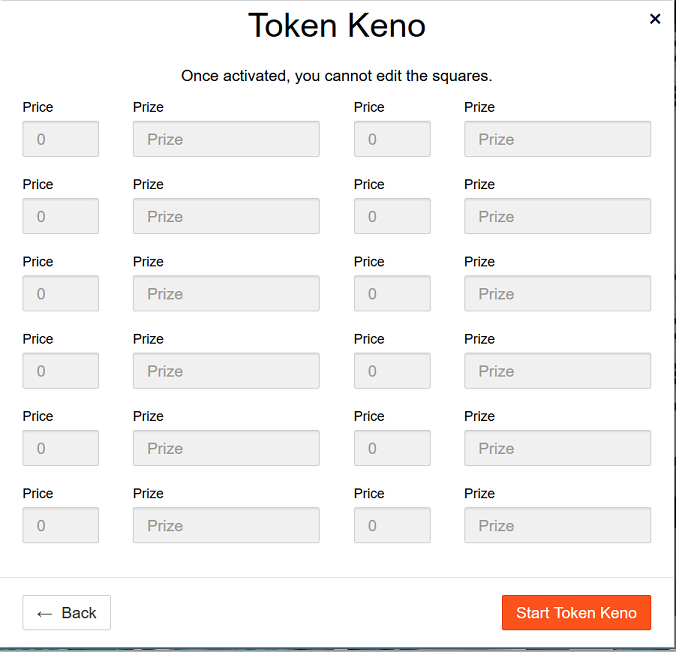 To start the game the performer has to click on the Start Token Keno button. Once the game is started the options cannot be edited. A chat notification will notify all users that the game is enabled. the prize input fields have a limitation of 15 characters. All viewers now can see the Play ‘Token Keno’ button in the action bar under the player, and if they click on it, the Token Keno game window will be displayed over chat. Here they can see a list of the prizes they can unlock and the squares they can choose with the cost to unlock them. The viewer is not aware of which prize the squares have. To play the game the viewer has to click on the square he wants to unlock. Once he clicks on the square an animation is displayed with unlocked prize. A chat notification is sent to inform all users that the viewer unlocked a prize. After a pick the game is paused for 1 minute, but the performer has the possibility to resume it faster by pressing the Allow Unlock button that replaced the Game Center button. The unlocked prizes are displayed in the game window as greyed out and strikethrough. After the last square is picked the game ends. The performer can end the game when ever they want, to do so they have to go to the game settings window and click on the End Token Keno button. In this game the performer start a poll for his viewers. He/she must set a cost per vote, a question, up to 5 options (answers) and a time limit. The performer can start the game by clicking the Start Chat Polls button and once the game is activated a chat notification is sent to all users and the Play ‘Chat Polls’ button is visible for viewers. the cost input field must be a value from 1 to 5.
the question input field has a limitation of 50 characters. the option input field has a limitation of 15 characters. the time limit is an amount of time from 1 min to 5 min. 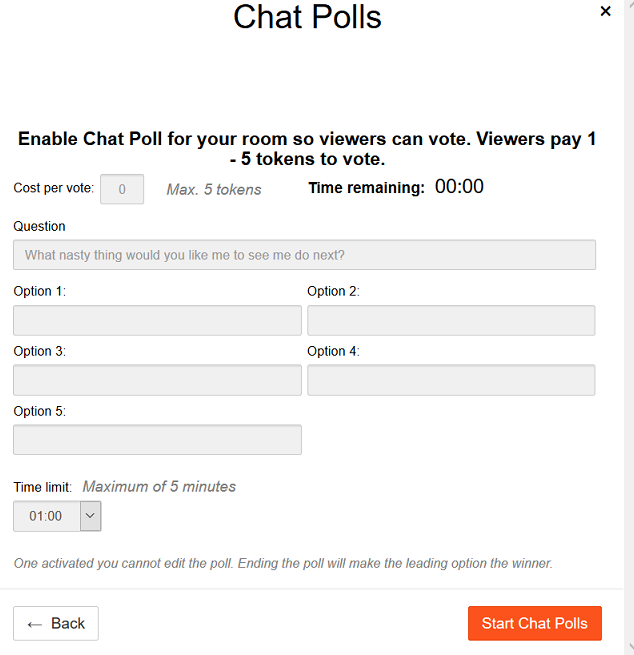 For the viewer to play the game he has to click on the Play ‘Chat Polls’ button and a game modal will be displayed over the chat. The viewer can click on any of the button options to vote. He can vote multiple times and when he does, a chat notification is sent to all users. After the time expires, an overlay is displayed in game modal with the winning option for all viewers and also on the broadcast window. A chat notification with the result of the vote is also sent in chat. The performer can stop the game at any time by clicking the End Chat Polls button in the game settings modal. If the game is stopped before the timer elapses, the result of the poll so far is sent throughout a chat notification to all users. In this game the performer can sell tickets for his viewers to win a prize after a draw. All he/she has to do is to set a prize, a price per vote and time untill draw. 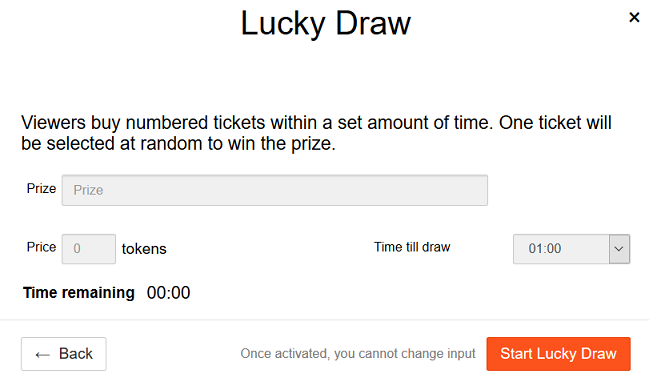 To activate the game, the performer has to click on the Start Lucky Draw button. the prize input field has a limitation of 25 characters. the time limit is an amount of time from 1 min to 30 min. Once the game is started, all viewers will see the Play ‘Lucky Draw’ button, and when they click it, they will get the game window over chat. Viewers can buy tickets by clicking on the Buy Ticket button, and once he does he will see his ticket number in the footer of the game window. A viewer can buy multiple tickets. Each time a viewer buys a ticket a chat notification will be sent to all users. When the time elapses, an winning animation will be displayed in the game window for the viewers and a chat notification will be sent to all users with the username and ticket number of the winner. In this game the performer can set up a number of prizes and a price per spin. The minimum number of prizes is 6 and the maximum is 12. The broadcaster must set the price per spin and also the minimum number of prizes(6) so that the game can be started. The performer can start “Spin the Wheel” with “Elimination mode” active or not. 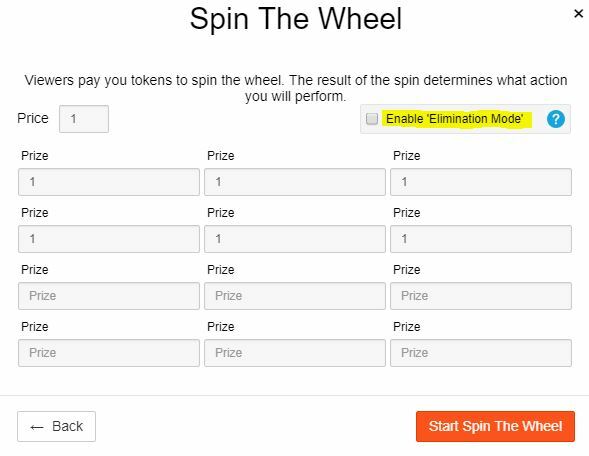 If the “Elimination mode” is active, prizes are removed from the wheel as they are won and the game will end after the last prize is won. The “Elimination mode” cannot be deactivated while the game is active. By default, the “Elimination mode” is not checked. The viewers will have to pay the price to spin and win a random prize. 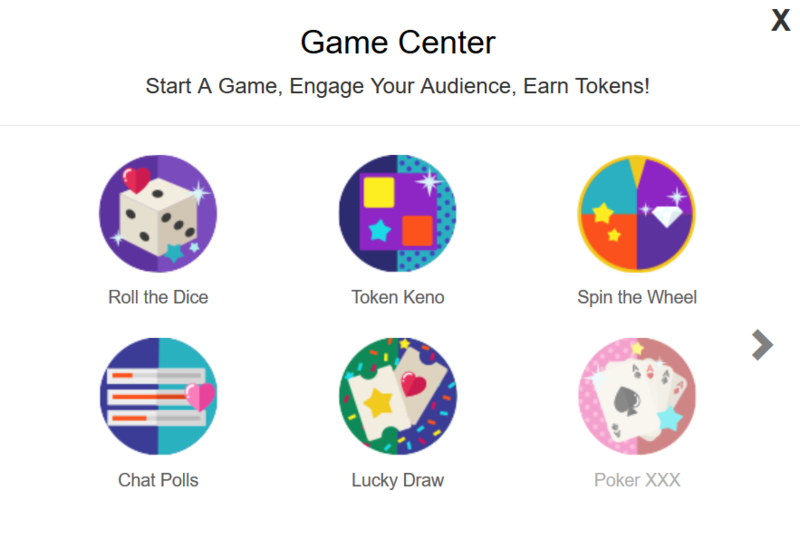 After the game starts, the “Game Center” button will be replaced with “Spin the Wheel”, on the performer side. After the performer starts a game a chat notification will be sent to all users with all the prizes in the game. 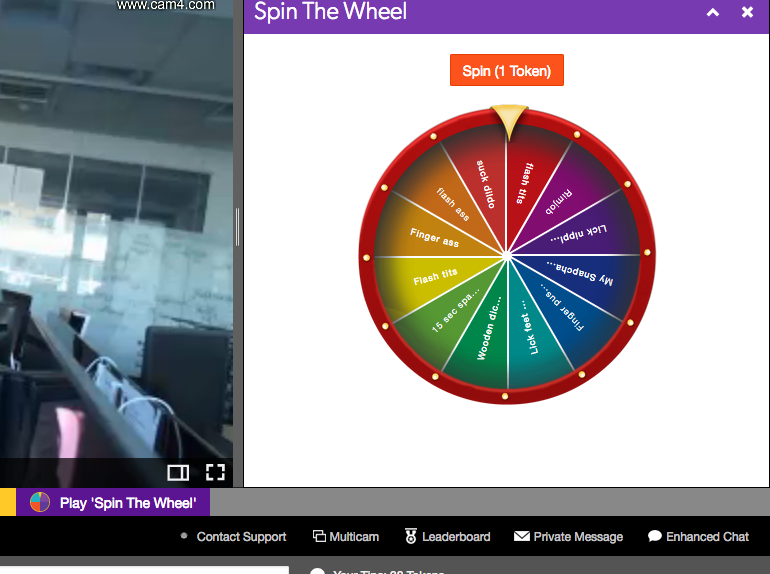 All viewers will see the Play ‘Spin The Wheel’ button, and once they click on it the Spin The Wheel game window will be displayed over the chat. 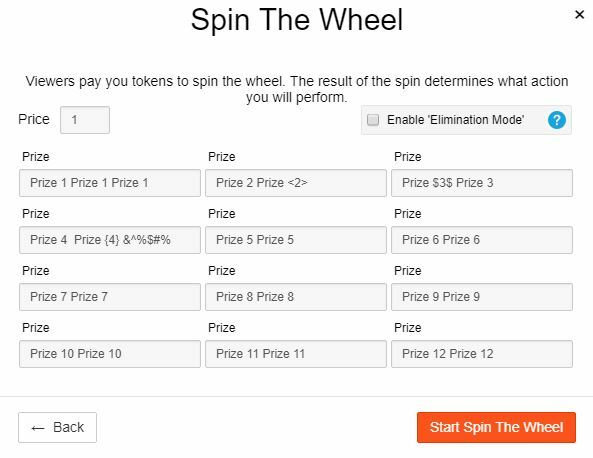 In the game window the viewers will have a Spin button with the cost per spin, and the wheel with all the possible prizes. A chat notification is sent to inform all users that a viewer won a prize. After a spin the game will be paused for 1 minute, but the performer has the possibility to resume it faster by pressing the “Allow Spin” button that replaced the Spin the Wheel button. The performer can end the game whenever he wants, and he can do it by clicking on the the “Spin the Wheel” button and the press “End Spin the Wheel”.